My friend and colleague Caroline commissioned me to make her a pair of gloves and this is them! This type of glove is brilliant for chilly spring and autumn days, and cold work environments! I work in an office and find them invaluable when I'm typing letters and it's bitterly cold outside! You can also pop them over fingered gloves for extra warmth! · Front Post Half Double Crochet (fphdc) – Yo and insert hook from the front to the back around the post of the hdc of previous row. Complete as for a regular hdc stitch. · Back Post Half Double Crochet (bphdc) - Yo and insert hook from the back to the front around the post of the hdc of previous row. Complete as for a regular hdc stitch. · Half Double Crochet 2 Stitches Together (hdc2tog) - Begin a half double crochet stitch as usual, instead of closing the stitch, insert the hook into the next stitch, yo and pull a loop through. (5 lps on hook). Yo and pull yarn through all loops on hook. Two hdc stitches have now become one. Gloves worked from top to bottom, from fingers down towards the wrist. Thumbs added separately. Make two, exactly the same. With 5.5mm (I) hook ch20, join last ch to first with a sl st to form a ring. Rnd 1: Ch2, hhdc into each st around, join last to first with a sl st.
Rnds 2 – 9: Repeat row one. Rnds 10: This row forms the thumb hole, ch2, hhdc around until last five sts, ch 5 and sl st to first hhdc in round. Rnd 11: This row increases width for the palm area. Ch2, hhdc into same st, * work 1 hhdc into next three sts, 2 hhdc into next st *, repeat from * to * around, working into 5ch as normal joining last hhdc to first with a sl st.
Rnds 12 – 14: Ch2, hhdc into each st around, join last to first with a sl st.
Rnds 15 & 16: Ch1, sc into each st around, joining last to first with a sl st.
Rnd 17: Ch2, hdc into each st around, join last to first with a sl st.
Rnds 18 & 19: These rows create the ribbing around the wrist area. Ch2, alternate fphdc and bphdc around, joining last to first with a sl st.
Rnd 20: Sl st around, fasten off and hide ends. Attach yarn beneath centre part of the thumb hole. Rnd 1: Ch2, hdc into next st, work 7 hdc2tog around. 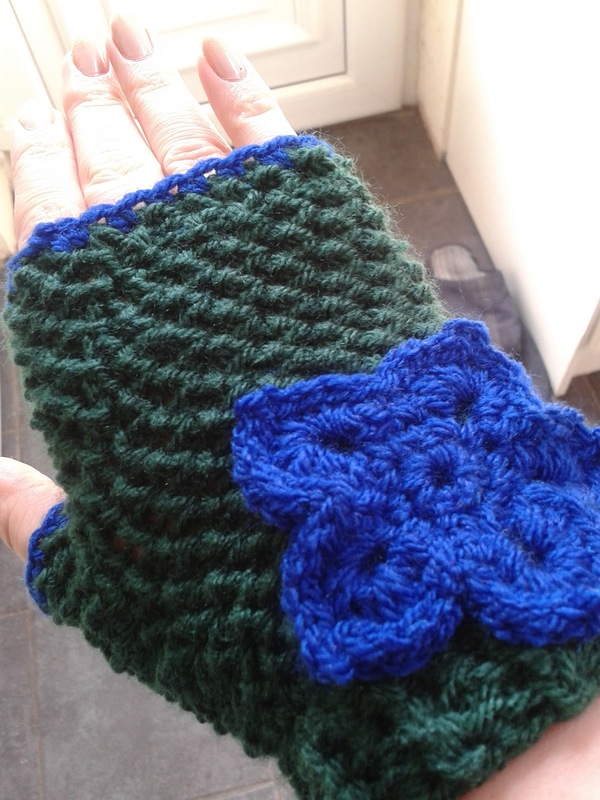 If you like, you can attach a different coloured yarn to the fingers and thumb edges, ch1 and work a round of sc around to match the flower, like in the example shown. Although the glove looks good without it too! With 4mm (G) hook ch4, sl st into first ch to form a ring. Rnd 1: Ch1, 6sc into ring, join with a sl st into first sc. Rnd 3: * Work 10 hdc into the 5 ch loop, sl st into the sc space of the previous round, repeat from * around, join with a sl st to end (forms 5 petals). Rnd 4: Sl st up the side of the petal, ch 2 at the top of the petal and sl st down the other side of the petal, work sl st into sc space of rnd two, continue around, join with a sl st to end (this creates points on each petal). Fasten off, leavings a long tail, 20cm or so and use this to attach flower to the glove – making sure to check positioning of flowers to make a left hand and right handed glove.